Have you ever bought new shoes and felt like you were walking on an ice rink when you wore them? Or maybe you have worn all the grip off the soles of your old faithful, favorite footwear. Knowing how to make shoes non-slip will help prevent falls and spills. You might need non-slip shoes for work, or just don’t fancy making a spectacle of yourself. Either way, slip resistant shoes are a must. Let’s take you through the options available to make your shoes less slippery. There are several things you can do at home to stop the bottom of your shoes acting like banana skins. We’ll give you step-by-step guides for each method to ensure you don’t lose your footing, wherever you are. It’s that nice smooth surface on the bottom of new shoes that makes them slippery. One way to combat this is to wear in the soles and heels of the shoes. Softening them and creating small nooks and abrasions will add traction. You can do this by walking over a rough, hard surface such as concrete or textured metal grating. Or go for a stroll along a route that has lots of gravel. If you don’t mind looking a bit silly, take your shoes out to the driveway and rub the soles on the floor with your hands. 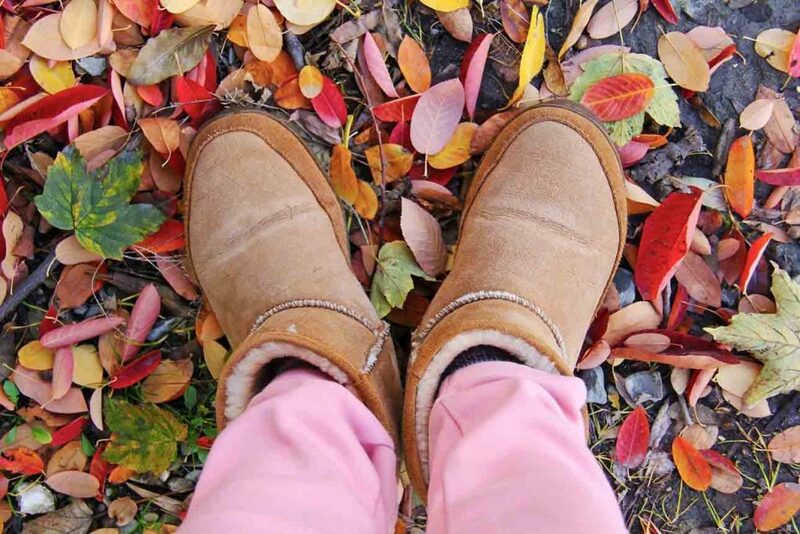 Watch your footing—you know your shoes are slippery so try not to fall. Maybe you don’t have concrete walkways or gravel paths near you, or you don’t fancy the risk of walking around in your slippery shoes. An abrasive sandpaper will also scuff up the soles and heels of your shoes, giving them more grip. Coarse sandpaper, about 50-grit would be perfect. Take a firm grip on your shoe. Rub the coarse side of the sandpaper over the sole and heel of the shoe. Concentrate on the parts of the sole that make contact with the floor. Rub until a coarse texture is obtained on the bottom of the shoe. Some soles, like those with a cardboard texture on flats and sandals, might not respond to this treatment. Test out your shoes after scuffing to make sure they are non slippery. If not, sand them down some more. 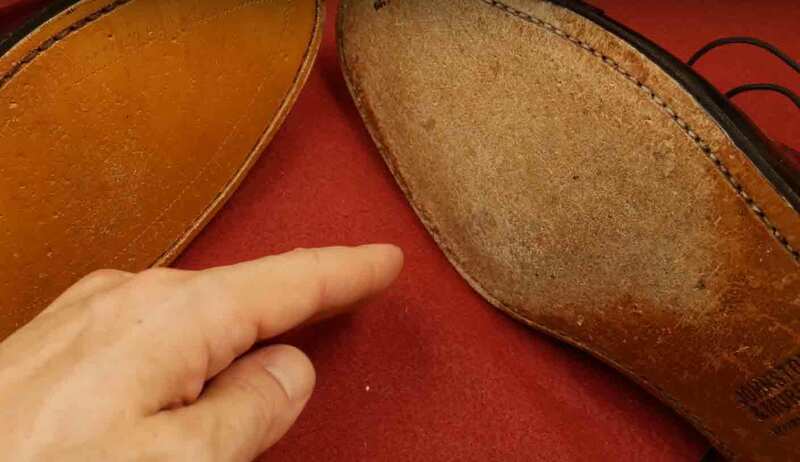 This YouTube video​ shows you how to sandpaper the soles of your new shoes. 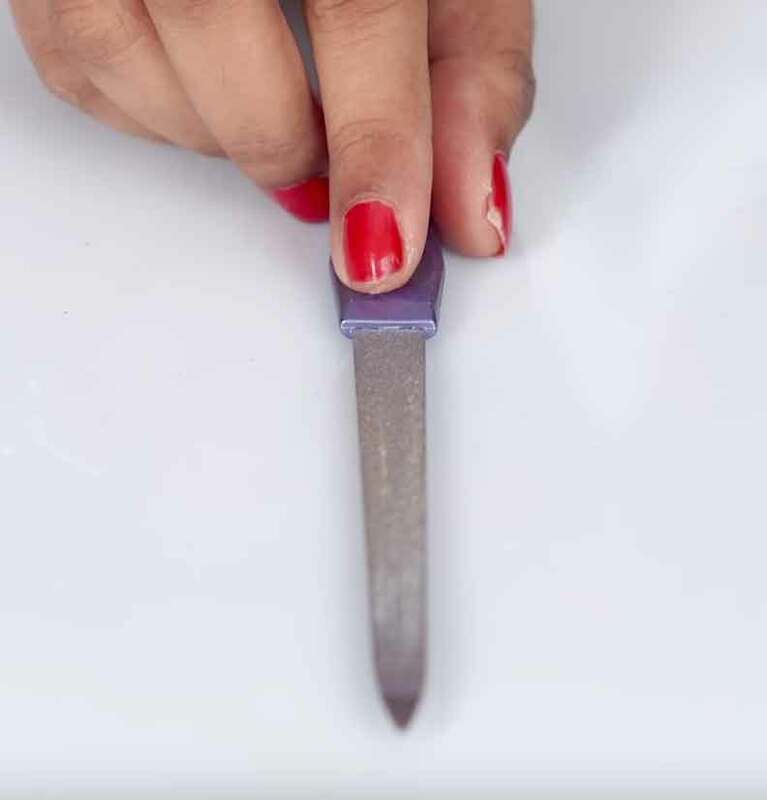 In the absence of sandpaper, a metal file or emery board can have a similar effect. A metal file or coarse emery board. Using the file or emery board, rub it over the smooth parts of the sole and heel. Concentrate on the areas that come into contact with the floor. Rub until the smooth surface is scuffed. The coarser the file or emery board, the better effect it will have in making your shoes slip resistant. Now, the sound of taking a razor or knife to the soles of your newly acquired shoes might not be very appealing. However, it’s a better option than lying in a heap on the floor because your shoes have no grip. A razor blade or sharp knife. Firmly hold your shoe, sole side up. With the razor blade or knife, carefully make shallow cuts diagonally across the sole. Cut again in the opposite direction, making a lattice pattern. Make the scoring as even as you can, not only will it look better, it will give you more traction. Simply wearing your shoes as often as possible can wear the soles down and make them less slippery. This option might appeal to you if you are willing to walk carefully in them for a while. It needs patience, though. The results could take a few weeks. Only use this method when walking on rough ground. 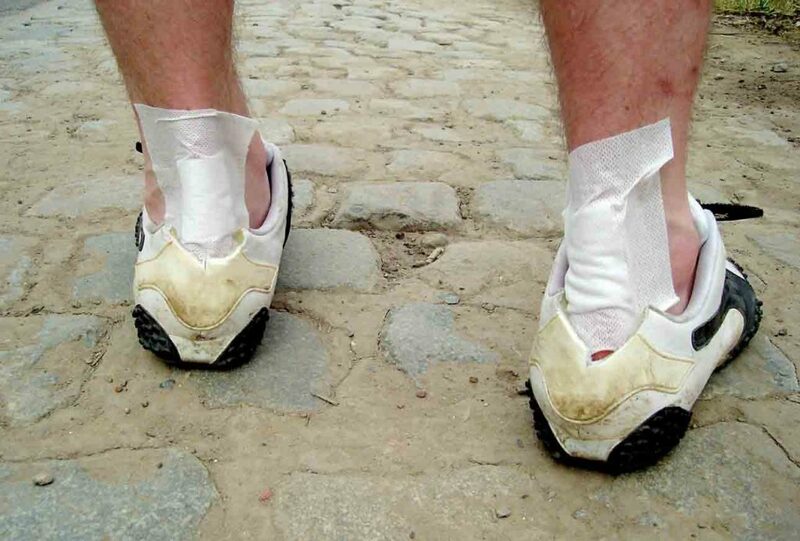 If you’re going to be walking somewhere likely to have smooth surfaces, wear a different pair of shoes. What Can You Put on the Bottom of Shoes to Make Them Less Slippery? Here are some ideas of products you can buy, plus a few DIY solutions, to help add traction and grip to the bottom of your shoes. If you work in a restaurant or as a bartender, your employer might insist on non-slip shoes for work. It makes sense in this fast-paced work environment, where you are on your feet most of the day. The methods we cover here will help make your shoes less slippery for restaurant work. However, they will work equally as well for any situation where you don’t want shoes to be—literally—your downfall! Doing a somersault as you enter the conference room at work, because your shoes have no grip, is never a good look. Grip pads are a good option, for both new and well-worn shoes. These adhesive pads are textured to give more traction to the base or heel of the shoe. They are specifically designed to keep you on your feet and stop you from looking like Bambi walking on ice. 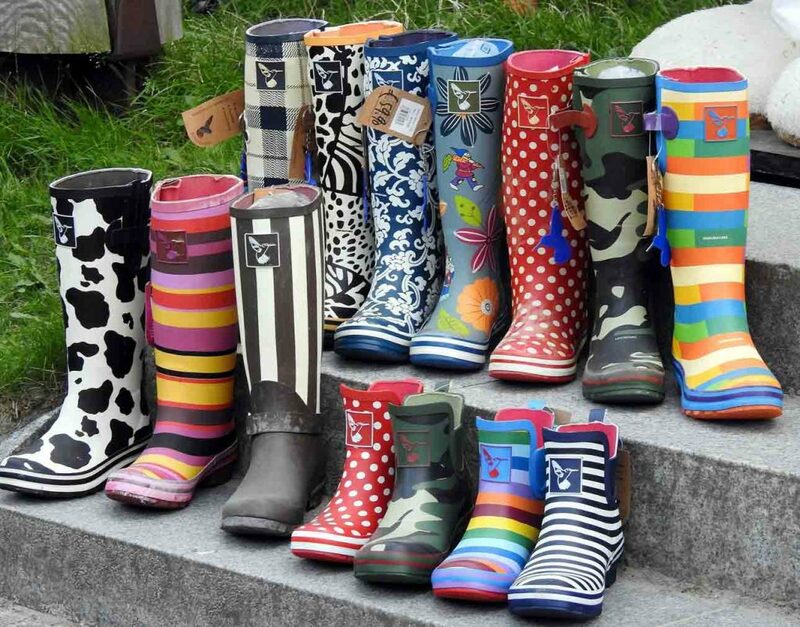 There are some which fit the sole of any type of shoe or boot and can be trimmed to size, like the Sure Step from Kiwi. Others are specifically designed for use with slippery heels, like the Dr. Dudu Anti-Slip shoe pads. These products are an inexpensive non-slip option, costing about $10. The purchased grip pads of your choice. Apply some rubbing alcohol to the clean cloth. Clean the sole or heel of your shoe with the cloth. Peel off the shoe pad’s protective covering. Hold it sticky side up. Position the shoe pad over the area of the sole or heel where it is to be applied. Press the pad firmly onto the shoe. Leave for 24 hours for the adhesive to set, before wearing the shoes. The pad might adhere better if you warm the sticky side with a hairdryer or heat gun before applying. To do this, place the grip pad, with the protective backing removed, on the palm of your hand—sticky side up—and warm it before applying to the shoe. If you find the adhesive on the pads allows them to peel off, use a shoe adhesive to stick them down again. This spray-on coating works in the same way as a shoe pad. It is designed to be sprayed on the base of the shoe to stop it being so slippery. These sprays can be bought at various outlets, such as wardrobe supply stores, or from Amazon. Sprays tend to be more expensive than stick-on pads, costing between $20 and $30. However, one container may treat several pairs of shoes. The products can also vary in quality, so do your research before you buy. A purchased can of grip or traction spray. Clean the bottom of the shoe with the cloth and rubbing alcohol. Spray the base of the shoe with the product. Leave it to dry thoroughly before wearing the shoes. Make sure you protect your clothing, work surfaces or floors before spraying. Cover the working surface with an old towel or several layers of newspaper. If you want a quick, cheap solution to add grip to the bottom of your shoes, you can use hairspray. Many of you might already have this in your home, readily accessible. If not, a quick trip to the drugstore will give you plenty of choices. Clean the base of your shoes with the cloth and rubbing alcohol. Generously spray the hairspray over the bottom of the shoes. Leave to dry: this will take about 30–60 seconds. The spray should feel tacky when it's dry. This is a temporary fix which will need to be repeated frequently. This method might not work in wet conditions, when the hairspray can wash off the base of the shoe. Puff paint, or dimensional fabric paint, is an arts and crafts product used for painting designs on clothing, like T-shirts. This paint dries with a rough texture, making it perfect for giving your slippery shoes a gecko-like grip. There are many different puff paints available at a reasonable cost. If you want to add a bit of color, a set like this one from Tulip will work. You could get glitzy with this dimensional fabric paint, also from Tulip. If you are more on the conservative side then Scribbles offers this paint in black. This is a semi-permanent solution which will require reapplying regularly to remain effective. Using the rubbing alcohol and cloth, clean the bottom of the shoes where you will paint. Apply a thin layer of paint. Leave it to dry for several hours before use. Why not get in touch with your creative side and paint a design on the base of your shoes. This method lets you personalize them any way you want. This YouTube video, from Glamrs, shows you how to apply puff paint, plus a few other tips we are covering. This is an inexpensive quick fix to make shoes non slippery. The multi-purpose tape is readily available in most hardware stores or online. I am sure we all have some of this at home already. Of course, everyone has adhesive bandages in their first aid kit. This fix will only work while the tape has some adhesiveness or as long as the bandage stays on the shoe. You’ll probably find it needs replacing often. A roll of masking tape or some strips of adhesive bandage. Place the tape at the front of one side of the shoe and attach it diagonally from front to back. Make sure you do this from the sole to the end of the heel. Cut the tape and trim the end to fit. For adhesive bandages, place one or two strips diagonally across the width of the sole and another across the width of the heel. Press down firmly, so they are secure. Repeat the steps, starting at the other side of the front of the shoe to form a cross on the bottom. Keep some masking tape in your bag or locker. This means you can re-apply it at any time if you find your shoes becoming slippery for work. This is an ideal way to make the slickness of your favorite pair of shoes less slippery. 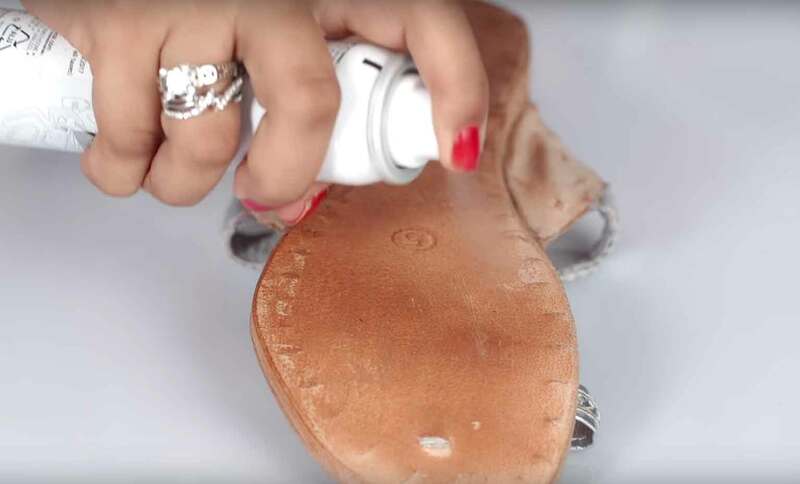 Using a hot glue gun, you can get more wear from your shoes without the risk of slipping over. If you don’t already have a glue gun, it can be purchased from most hardware stores or online. Clean the bottom of your shoes with the cloth and alcohol. Prepare the glue gun: plug it in and insert a glue stick until heated. Glue dots or lines at even spaces over the heels and soles of your shoes. Wait until the glue is just about dry (it should no longer feel tacky). Put on your shoes and walk on a hard surface. This helps to press the glue dots down and make them level. This How-To YouTube video shows you how to apply hot glue to the soles of slippers, although the same principle works for shoes. Rubber glue, or rubber cement, mixed with salt, will produce a grainy texture when painted onto the sole of your shoes. This will give them a better ability to grip on slippery surfaces. Rubber glue is readily available online and in hardware or craft stores. Clean the bottom of your shoe with the cloth and rubbing alcohol. Mix some salt grains into the rubber glue. Paint a thin layer of the mixture onto the sole and heel of your shoe. Allow to dry thoroughly before wearing. The more salt you add, the greater the grip will be. Just make sure you don’t add so much that it won’t spread in the glue. Make sure you use rubber glue; other types of glue could ruin your shoes. Another grainy solution for slippery shoes is to use sand and spray adhesive. This will give shoes more traction and roughen the bottom of the shoes. Clean the bottom of the sole and heel of your shoe with the cloth and alcohol. 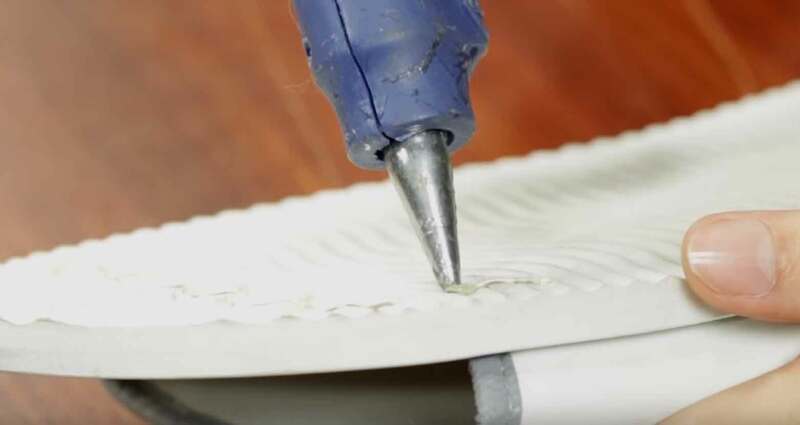 Carefully spray the bottom of the shoe with the adhesive. Sprinkle sand evenly over the adhesive. Wait for it to dry thoroughly. Test out your non-slip solution. Using a heavy-duty spray adhesive such as Gorilla spray glue will last longer. It also dries clear, and is suitable for most materials. We sometimes think of shoes being slippery only when they are new or old and worn thin. However, think about going out in the winter months when there might be ice and snow about. 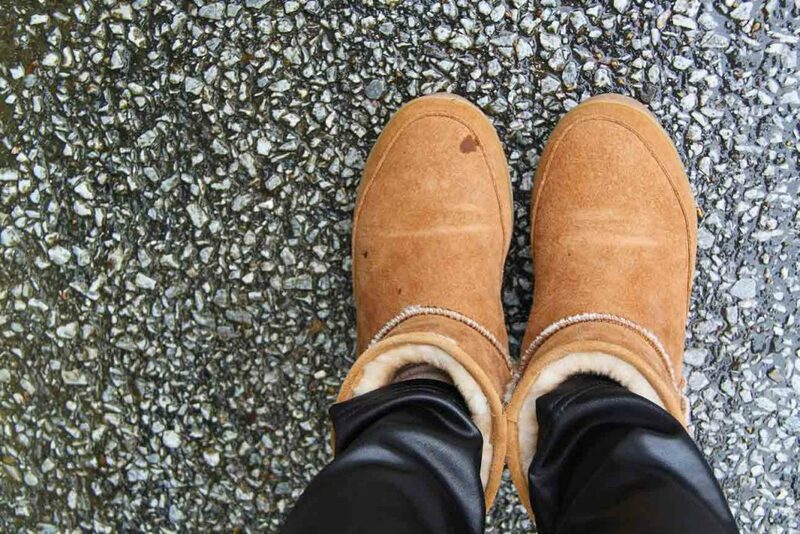 Even your most stable pair of boots or walking shoes, despite their normal traction, might still be too slippery. We put chains on the tires of our vehicles in heavy snow, to stop them sliding all over the road. Why not do the same for your shoes? There are many ice grips available that will slip over your shoes for use when the sidewalk turns into an ice rink. They are generally heavy-duty rubber, with some sort of metal grip. Some even look like tire chains, made solely from metal. This solution for slippery shoes can also work if you go hiking over rough, muddy terrain, or jogging when it’s wet. Additionally, this could be a perfect solution for work if your profession means you are outdoors in bad weather conditions. We have outlined many home solutions for making your shoes more slip resistant. However, we know—especially for the fashion-conscious—how precious a new pair of shoes can be. You may not want to attempt to fix the issue yourself. If this is the case, you can take your shoes to a cobbler or shoe repairer. They are professionals trained in caring for shoes. They can either modify the sole already on the shoe, or replace it with a non slip option. You will often find these services come at a cost, possibly up to $100 for one pair of shoes. This outlay can be worth it if it means you can show off your latest trendy acquisition without fear of falling over. There are a few things you need to take into account when modifying your shoes to make them slip resistant. Certain jobs will require you to wear shoes that are certified as non-slip. This particularly applies to those in the hospitality sector, such as restaurants and bars. This rule can form part of your employment contract. If this is the case then the DIY solutions we have detailed might not be acceptable. Check with your employer before you risk wearing shoes you have modified yourself for work. You could be breaking the terms of your employment. Apart from that you might fall over and injure yourself if your home remedy is ineffective. These rules are there for a reason, and they protect you and your employer. If you have any doubt, there are shoes you can buy which are rated on a scale known as the coefficient of friction. Check what scale your employer requires and stick to it. 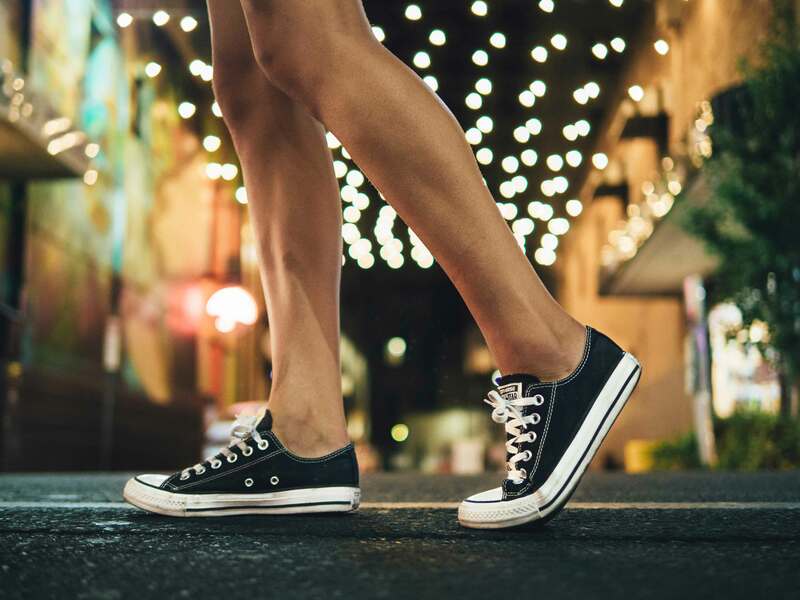 Once you apply one of the techniques for making your shoes less slippery, make sure you try it out in a safe environment. You want to make sure that the solution you have chosen is effective and that your shoes are now providing some grip on slippery surfaces. Maybe walk around the house first and then venture out around the block. Is the Fix Suitable for the Shoe Material? Some products used to make your shoes slip resistant might not be compatible with the material your shoes are made of. Delicate leather could be damaged by adhesive sprays or hairspray, for example. While this is the exception rather than the rule, make sure you check before going ahead with a modification. The last thing you want is discoloration or degradation of your brand new shoes. Whenever you are using a spray on the soles of your shoes, be sure to protect the uppers. We suggest that you lightly tape a piece of cloth over the top to protect them. We all get attached to a faithful old pair of shoes. When they are worn in and comfortable, it can be hard to part with them. If the soles and heels feel like they are coated in lubricant when you walk, try one of our fixes. If it doesn’t work, the last thing you want is to have a nasty spill that might injure you. It may be time to retire your shoes and invest in a new pair. On the other hand, you might have a new pair of shoes which are just too slippery for the purpose you bought them. You don't want to fall over on the dance floor or skate your way into the boardroom. If you can't repurpose them, rather than relegate them to the back of the closet, donate them to charity. Someone else might be able to wear them if you can’t. Having a slippery pair of shoes is no fun. You will feel unsteady on your feet and end up unable to wear them. Luckily, there are many solutions you can try to fix the problem. The result will be a non-slippery pair of shoes for dancing, for work, or just for walking about in. I know I enjoy feeling more steady on my feet, hopefully, these tips will make sure you do too. Did this guide help you find the solution you needed for your slippery issues? If you enjoyed it, let us know, and leave a comment. If you try any of the solutions, share with us how you got on. If you think this article would be useful to others, please share, so they can also benefit from learning how to make shoes non-slip.